Embroidery, Polo's and T-Shirts. Flat or Puff - premium look. When making up your mind on whether to decorate your apparel using Embroidery or Silk Screening, you must first decide what the use of the item will be for. Embroidery is commonly used for a more professional look (i.e. Polo’s and Dress Shirts). Silk screening is more time intensive as we must create the screens which causes the set-up time to take much longer. (I will talk about Silk screening in my next blog.) When you decide to embroider apparel, it is important to know what clothing you want it on. Certain fabrics are more favorable for this job. We will guide you through the entire process. Branding, can be put on a wide variety of materials. Offers great name recognition, lasts longer (because it is thread, there is no ink to wear off like with screen printing), large thread color selection which you can use to make your company appear more professional and you can launder/wash the embroidery site just like garment/accessory that your logo is embroidered on. Quality apparel is also a great way to boost employee morale. Process is started when you supply a clean vector logo which we will then digitize to make your logo appear as close as possible with a needle and thread. Next you will receive a Sew-Out Proof on a piece of cloth so that you can visibly see what the embroidered piece will look like. You are able to make any changes if it does not look perfect. 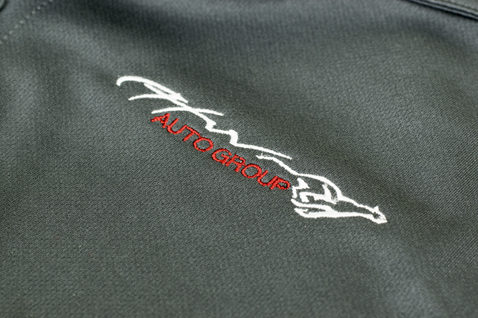 Once you approve the sew out sample of your logo, we then take your apparel items and embroider them. (We put a white backer cloth on the inside to keep the threads from ripping through the material.) When completed we cut around the inside backing cloth to make it look clean.